The 12-metre container before being transported to Athlone North Primary School. 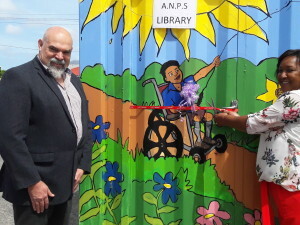 After an arson-instigated fire caused devastation to a large part of their school’s infrastructure, learners and teachers at Athlone North Primary School once again have a library. After considering a number of schools as part of their 2018 CSI programme, Oxford University Press South Africa decided that Athlone North Primary School was an obvious choice. The school’s 579 learners had been stranded without access to books and other vital resources since the school library, as well as a classroom and minor hall, were destroyed in March. The container has been decorated inside and out. Artist Izak Vollgraaff was commissioned to paint the container with the assistance of Oxford staff members who also donated numerous games, toys and resources to help with furnishings and décor. 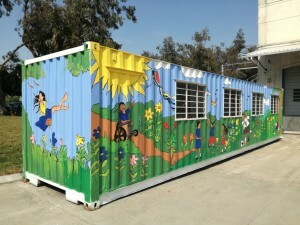 The 12-metre container has been fitted with sturdy shelving, an interactive carpet, curtains, a fan, a chair for the teacher on duty, and 30 handmade pillows for learners to sit on and enjoy their books. 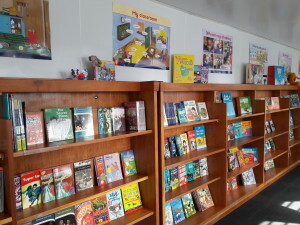 The library has been stocked with over 700 books donated by Oxford University Press South Africa. Oxford University Press South Africa thanks those who joined forces to help make this project happen: AAD Trucks sponsored the transportation of the container, Builders Warehouse Tokai assisted with carpeting, Crazy Chairs Woodstock assisted with the chair and Mia Grobler made the pillows.